Two-post parking lifts are popular because they service one purpose: parking vehicles in tighter spaces. 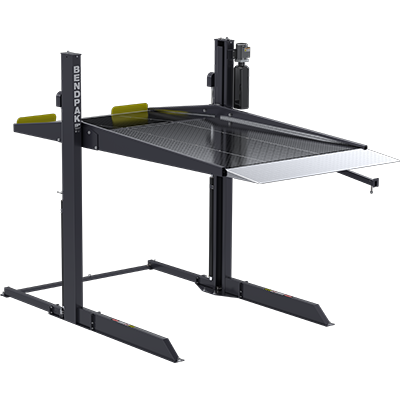 Unlike wider four-post lifts that double as parking lifts, the PL-7000DLX has all the lifting height while taking up less space in your garage. This makes them ideal for both home users and professionals who want to stack multiple ​lifts side-by-side without an inch of room to spare. The units can be staggered or installed in an even row. The PL-7000DLX features lengthened and reinforced front legs that lessen the pull-out tension load on the front anchors. The front legs extend ​483 mm farther than the PL-7000XR. The deluxe galvanized platform on the PL-7000DLX is a zinc-coated thing of beauty. The galvanization process makes the steel virtually indestructible. Neither weather nor abuse will ever mar or rust out the deck. The diamond-plate is attractive and non-skid, so it offers superior grip for vehicle tires. It's also now secured in place with fasteners. These bolt-on diamond-plate center panels work to strengthen the lift, so the deck stays reliable for many years of extremely low-maintenance service. The drive-on ramp has been extended ​635 mm to accommodate low ground-clearance vehicles. The ramp is now full width to make vehicle approach easier, especially for wide vehicles and large tires. The PL-7000DLX control arm has been raised to ​1,829 mm for increased drive-under clearance. The increased height also makes the controls easier to access. The base support on the PL-7000DLX is only about the length of a car and just wide enough to provide perfect stability, but it doesn't sacrifice crucial safety features for the sake of being compact. In fact, BendPak has built its reputation on making car ​lifts that are extraordinarily safe and tested more rigorously than the competition. Key activation puts you in complete control of your parking lift structure. This is a safety feature that's obviously convenient for operators in garages. It keeps the controls in the hands of those certified to use it. It's also great for home users. Kids, pets and foolish friends won’t raise or lower the platform just by bumping the buttons.